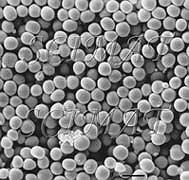 Staphylococcus aureus belongs to foodborne pathogens. The Bad Bug Book provides information on foodborne pathogenic microorganisms and natural toxins. 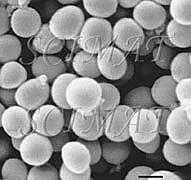 Staphylococcus aureus bacteria have been described as small, sphere-shaped organisms (shown above) that travel in pairs, long chains, or bunches like grapes. They get into the air when someone breathes, talks, sneezes, or coughs. These bacteria are found on the skin, in the nose, throat, pimples, boils, carbuncles and acne. They may contaminate the following foods: egg salad, potato salad, chicken salad, macaroni salad, custards, ham, salami, cheese, cooked poultry and dressing, beans, creme desserts, milk products. Food poisoning symptoms include vomiting, diarrhea, prostration, abdominal cramps, retching, weakness. Onset is usually sudden, usually within 2 to 8 hours and may last 1 to 2 days. The illness is caused by a toxin which is produced by the bacteria growing in the food. Food poisoning may be prevented. To ensure that S. aureus bacteria do not produce their toxin in the foods, it is important to keep the foods above 60°C or below 5°C. Once the toxin is formed, it is not easily destroyed by heat. In this case, reheating mishandled food will not make it safe. A bacterial culture of Staphylococcus aureus was provided for scanning electron microscopy by Dr. Parviz Sabour. The micrograhs are protected by copyright. For technical and scientific information about the images featured please contact the author. Commercial interest in micrographs should be directed to photo banks such as CMSP, MS, PR, PTUSA, etc.